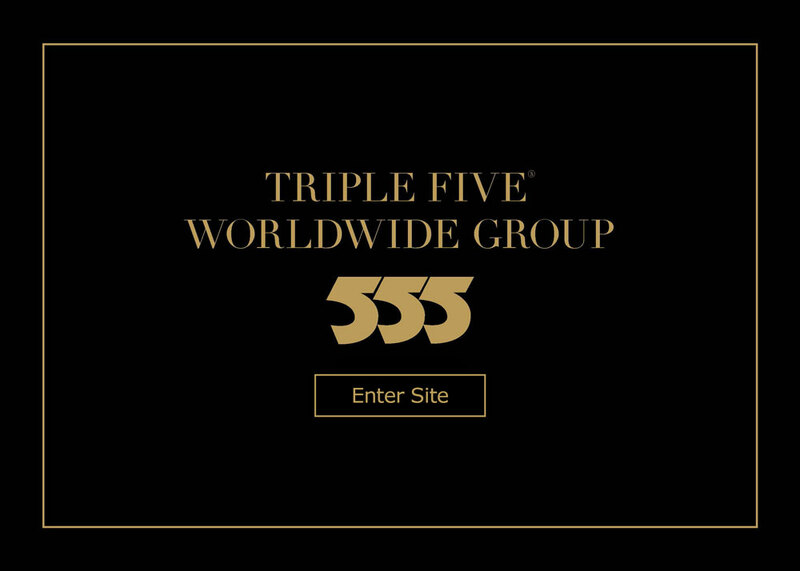 Warning: There are individuals and companies operating in China and elsewhere (some of which may have had a relationship with Triple Five that has since been terminated due to significant breaches of contract and for repeatedly engaging in unauthorized, deceptive and misleading conduct) who are using Triple Five’s name, trade marks and trade names fraudulently without our authorization or consent, including, without limitation, the Triple Five Logo, 555, T-5, T5, 35 Group, Triple Five, 35, 35 Malls, 555 Group, 555 Malls, Motian Sanwu, T5 Group,T-5 Group, T5 Malls, T-5 Malls. In addition, these individuals and companies have produced brochures, created and continue to use web sites and e-mail addresses incorporating our intellectual property without our authorization or consent which are misleading the general public that they can represent, negotiate for and bind Triple Five Worldwide and its associated and affiliated companies. Specifically, the following individuals are NOT authorized to represent, negotiated for, act for or bind Triple Five Worldwide or any of its associated or affiliated companies: Mr. Christian Chu (Chao-Ming Zhu), Mr. Jeffrey Chu, Mr. Zhang Yuanfeng, Mr. Zhang Xianying, Mr. Cai Nengcheng, Ms. Wanting Chu, Mr. Zheng Youchao, Mr. We Jaing, Ms. Wanting Zhu, Mr. Jiang Wei, Mr. He Hui, Mr. Zhu Zhiwei, Mr. Yang Qingquan, Mrs. Liu Xiaorong, Mr. Yuen-Ning Zhu, Mr. Qing-Wen Meng, Mr. John S. Herrington, Mr. Watson Latech, Mr. Claude B. Hutchison Jr.,Mr. John Laetech, Mr. David Grohol, Mr. Thomas Race, Mr. Aaron Lin and other persons associated with any of them of their companies. In addition, the following companies are NOT authorized to represent, act for, negotiate on behalf of or bind Triple Five Worldwide or any of its associated or affiliated companies: Superlane Investments Co. Ltd.; Superlane Investment Limited; Superlane Investments Ltd.; Meadowlands Investments Limited; T-5 Superlane Holding Co. Ltd.; T-5 Superlane (Qingdao)Tourist Development Company; Triple Five (Qingdao) Tourist Development Company; T5- Superlane Investment Limited; 555-Superlane Group; Triple Five (Beijing) Enterprise Management Co. Ltd.; World Ventures (Qingdao) Tourist Development Company; Triple Five (Tianjin) Private Equity Fund Co. Ltd.; Triple Five Development & Design Co., Ltd.; Triple Five Investment Co., Ltd.; Triple Five Holding Co. Ltd.
以下是其中非法盜用品牌及商標人仕名單.名單內人仕絕未得到三五世界企業同意或授權,名單內人仕絕對無任何權力代表三五世界企業. 朱兆銘先生(Mr. Christian Chu), Jeffrey朱先生 , 張源峰先生(Mr. Zhang Yuanfeng), 張顯英先生(Mr. Zhang Xianying), 蔡能成先生(Mr. Cai Nengcheng), 朱晚亭 女士(Mrs. Wanting Chu), 張友超先生(Mr. Zheng Youchao), 姜偉先生 (Mr. Wei Jaing).刘晓蓉女士( Madam Liu Xiaorong), 杨清泉先生 (Mr. Yang Qingquan), 朱悦宁先生 ( Mr.Yuen-Ning Zhu), 孟庆文先生 (Mr.Qing-Wen Meng) 朱志伟先生(Mr. Zhu Zhiwei), 何辉 (He Hui), 林胜荣先生(Mr. Aaron Lin), 張獻迎 (Mr. Zhang Xianying), 盧宗昀 (Mr. William Lu), Mr. John S Herrington, Mr. Watson Latech, Claude B Hutchison Jr, Mr. John Latech, Mr. David Grahal, Mr. Thomas Race, Tom Chang 這也包括所有其它凡是與以上名单所屬公司有关係的所有人員和公司與附屬公司. 以下公司名单绝对不能代表三五世界企業或三五世界企業的附屬公司作任何協商，代理及綁定的任何協議和合約和承諾. 如下是公司名單: 摩天投資公司, 摩天投資有限公司, 馬度連投資有限公司, 摩天三五公司; 摩天三五青島旅遊開發公司, 摩天三五投資有限公司, 摩天555集團, 三五北京企業管理公司, 青島世界旅遊開發公司, 三五天津私資基金公司, 三五設計開發公司, 三五投資公司, 三五控股有限公司. 摩天三五开发设计有限公司, 三五投资有限公司.